A full-scale replica of a NASA space shuttle will come into dock Friday (June 1), but rather than pull into a space station, it will arrive at port in a Texas lake near the space agency's Houston space center. 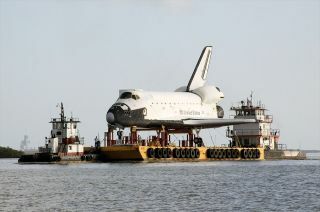 The high-fidelity space shuttle mockup, which was known as "Explorer" for the 18 years it was at NASA's Kennedy Space Center Visitor Complex in Florida, will sail into Houston's Clear Lake to a dock opposite the Johnson Space Center, where it will be offloaded for display. The replica left the Florida spaceport on May 24 atop an open-air, flat-bed barge and has since been making its way around the Florida peninsula and through the Gulf of Mexico. It entered Galveston Bay on Thursday (May 31). Its arrival in Clear Lake, which is expected between 4 p.m. and 6 p.m. EDT (2000 to 2200 GMT), will kick-off a weekend "Shuttlebration" that will culminate in an early Sunday morning parade to move the mockup 1-mile (1.6-kilometer) to Space Center Houston, the official visitor center for Johnson. A high-fidelity mockup of a NASA space shuttle sits atop the barge taking it Houston, Texas, as seen on May 23, 2012, the day before it departed from the Kennedy Space Center, Fla. The Friday evening celebration will end at 10 p.m. EDT (0200 GMT June 2) with a fireworks display over Clear Lake. On Saturday, cranes will off-load the 122.7 foot long by 54 foot tall (37.4 by 16.5 meter) mockup off the barge and onto a wheeled transporter. The 130,000-pound (60,000-kilogram) replica is the largest item to come on shore using the Johnson Space Center dock since the three stages of a Saturn V moon rocket arrived in 1977 for display.